Telangana Ayush Department to fill the Medical Officers, Lecturers in Telangana Ayush Department: Applications are invited through Online www.ayushrect2018.telangana.gov.in(Telangana Ayush State Recruitment Website 2018) from the eligible candidates for appointment to the posts of Medical Officers (Ayurveda) -62, Medical Officers (Homoeo) -36, Lecturers (Homoeo)-11 and Lecturers (Unani)-8 on regular basis under the control of Director, Department of AYUSH, Hyderabad, Telangana state. The Detailed Notification, User Guide & Information Bulletin is made available in the website www.ayushrect2018.telangana.gov.in with effect from 30/8/2018. Eligible candidates shall submit their applications through online from 5/9/2018 to 15/9/2018. Govt. of Telangana, Dept. 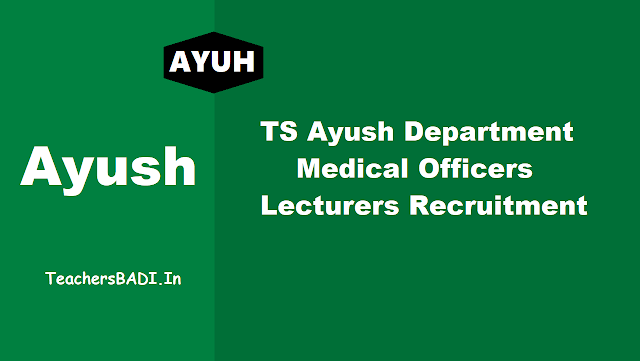 of Ayush - Medical Officer, Lecturer Posts : Govt. of Telangana, Dept. of Ayush invites applications for the following posts on regular basis. 1. Must possess a BHMS degree for the posts of Medical Officer (Homoeo) respectively awarded by a University in India established or incorporated by or under a Central Act or State Act or an Institution recognized by the University Grants Commission or any Statutory Board of the State Government. 1. Must possess a Degree in Ayurveda awarded by a University in India established or incorporated by or under central Act or State Act or Provincial Act or an institution recognised by the University Grants Commission or any statutory Board of the State Government after having undergone a regular course of institutional study in the respective systems , both in theory and practical for a period not less than 4 ½ years duration in a teaching institution recognized by the university or state government with one year compulsory internship. 1. “Must possess a Post Graduate Degree in Unani, awarded by any University in India established or incorporated by or under Central Act or an Institution recognized by the University Grants Commission or any Statutory Board of State Government in the concerned specialty allied as per CCIM latest regulation as notified above . 1. Must possess a Post Graduate Degree in Homoeopathy, awarded by any University in India established or incorporated by or under Central Act or an Institution recognized by the University Grants Commission or any Statutory Board of State Government” in the concerned specialty /Allied as per the existing CCH Norms. Not exceeding (43) years for OCs and (47) years for SC/ ST/BCs as on 01/7/2018 as per the provisions contained in the Telangana Homoeo Medical service rules issued in G.O. Ms. No. 69, HM&FW (I2) Deptt; dt. 14.3.2005 adapted vide G.O. Ms.No. 39, HM&FW (E.1) Deptt; dt. 30.5.2016 and G.O. 318, HM&FW (R2) deptt; dt. 28/8/2008. How to apply: Candidates shall submit their applications through online from 05.09.2018 to 15.09.2018. Procedure for submission of application online: Detailed procedure for applying ONLINE mode is given in the Information Bulletin. Candidates can download the “Information Bulletin” free of cost from the website www.ayushrect2018.telangana.gov.infrom 30/08/2018onwards. Eligible Candidates shall submit their applications through online from 05/09/2018 to 15/09/2018. The fee prescribed for applying for Medical officers (Ayurveda) is Rs.600/- (Rupees Six Hundred Only) towards online Application Processing Fee. Candidates can pay the fee through payment gateway/credit/debit card/net banking between 05/09/2018 to 15/09/2018 and submit online application at the website www.ayushrect2018.telangana.gov.in between 05/9/2018 to 15/09/2018. The Detailed Notification, User Guide & Information Bulletin will be made available in the website www.ayushrect2018.telangana.gov.in with effect from 30/8/2018. Govt Order for Medical Officers, Lecturers Recruitment in Ayush Department : Telangana Government has given permission to fill 183 One Hundred and Eighty Three vacant posts of Medical Officers and Lectures in the Department of Ayush, Telangana, Hyderabad, through the Telangana State Public Service Commission, Hyderabad. GOVERNMENT OF TELANGANA: Public Services - Health, Medical & Family Welfare Department - Recruitment - Filling of (183) One Hundred and Eighty Three vacant post of Medial Officers and Lectures in the Department of Ayush, Telangana, Hyderabad, through the Telangana State Public Service Commission, Hyderabad - Orders - Issued. Reference: HM & FW (E1) Department U.O.No.1691/E1/2015, dated:25.04.2017. Has the notification arrived yet fir these posts? Have the notification released yet for this post?